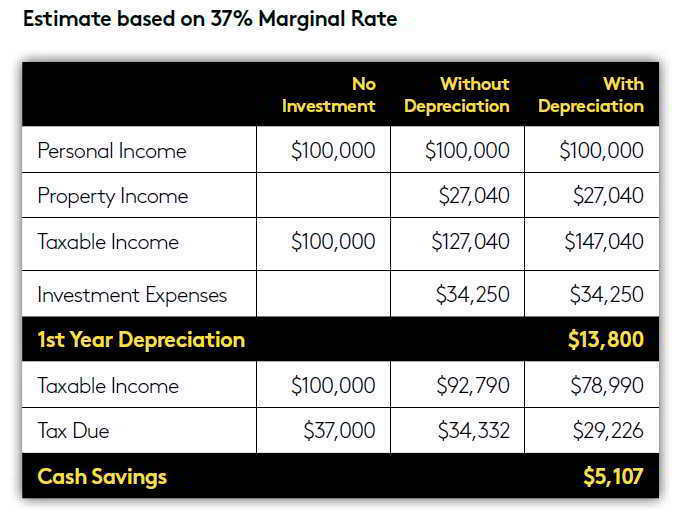 Here are some helpful terms you main encountered when reading about depreciation. Assets used in the business. Examples: buildings, machinery, equipment, office furniture, vehicles, etc. The Australian Tax Office provides detailed information on the legalities of property tax depreciation. Our tax agent registered Quantity Surveyors are constantly updated on all new legislation relating to property tax depreciation so you can rest assured that your report will be compliant with Australian Tax Office requirements. How much might you get? How much you can claim depends on a number of factors, including the type of property as well as a purchase date and price. Every investment property has deductions that its owner can claim, and they’re often in the thousands. Because each property is different, an inspection is the best way to assess your property both inside and out. Aside from an inspection, there are other factors that will contribute to the total calculation of available depreciation. Such factors are: Purchase date (settlement date), Property type, Purchase price, Land values, Stamp duties and land taxes paid,Stamp duties and land taxes paid, Legal fees associated with the purchase of the property, Age of the building (when it was built), Any additions, amendments, refurbishments or improvements to the property. How the depreciation will impact you very much depends on your financial situation. 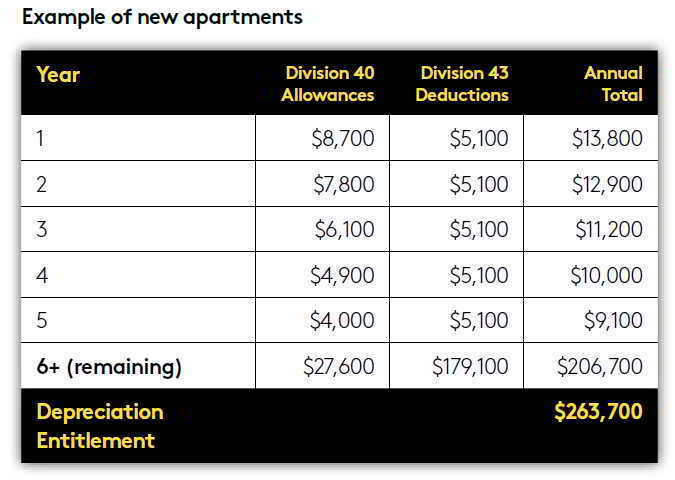 But to give you a brief example of how depreciation can effect a property investor, the tables below provide an example of the depreciation deductions on a property and how much one may be eligible to claim. How can Property Tax Depreciation increase your weekly income? We all know, cash is king. More importantly – MORE cash is king-er. The beauty about property tax depreciation is that it’s a fixed annual deduction. And with it you can forecast your annual taxable income, and the deductions against it. The Australian Taxation Office has what’s called PAYG Withholding Variation. Formally known as a FORM 15. The Commissioner of Taxation may vary the amount a payer is required to withhold from a withholding payment, in order to meet the special circumstances of a particular case or class of cases. The main purpose of varying your rate or amount of withholding is to ensure that the amounts withheld by your employer during the income year best meets your end of year tax liability. Knowing your property depreciation, along with other investment expenses allows you or your accountant to calculate and forecast your expected tax deductions allowing you to apply such deductions to your PAYG payments. In laymen’s terms, this means rather than waiting to the end of the financial year, you can enjoy your tax refund every time you are paid! Simple. More cash in your pocket now! You must be careful not to over claim here, so we strongly suggest that you seek specialist and expert advice from an Accountant or Financial Advisor on what is the best option for you. To find out how much you might get click here. To find out more about the Australian Tax Office PAYG withholding variation please click here. There are two main areas to property tax depreciation; the plant & equipment and the capital works deductions. Plant & equipment (also known as Division 40) are items that are usually mechanical fixtures or those which can be easily removed from the property as opposed to items that are permanently fixed to the structure of the building. Plant and equipment items include but are not limited to: Hot water systems, Carpets, Blinds, Ovens, Cooktops, Range hoods, Garage door motors, Door closers, Freestanding furniture, Air-conditioning systems, Unfixed lighting, BBQ’s, Heaters and Flooring (floating floor boards). The value ascribed to the Division 40 items relates to the purchase price of the property. Capital Works Allowances (also known as Division 43) are a deduction for the structural elements of a building. It is based on the historical construction costs of the building and includes materials such as, but not limited to: Bricks, Mortar, Plaster walls, Flooring (fixed timber flooring), Wiring, Doors, Tiles, Windows, Toilets, basins, shower hobs, Guttering, Roofing, Concrete slabs, Foot paths and Driveways. From the date construction was completed the Australian Taxation Office (ATO) has determined that any building eligible to claim capital works deductions has a maximum effective life of 40 years. Therefore, investors can generally claim up to 40 years of property depreciation on a brand new building, whereas the balance of the 40 year period from the construction completion date is claimable on an older property. Importantly, you can claim renovations completed by previous owners of the property. Anything in the property that occurred in a previous renovation can be inspected by one of our inspectors. Our Quantity Surveyors will then estimate the renovation costs and then calculate the deductions accordingly. This includes items that are not so obvious, for example: New plumbing, Water proofing and Electrical wiring. For capital improvements to be eligible for capital works deductions, construction must have commenced within the qualifying dates which are after the 18th July 1985 for residential buildings, and after the 20th July 1982 for commercial buildings. In need of a property tax depreciation schedule? Order Tax Depreciation Schedule to order your schedule now. Click here to find out how depreciation can help you. 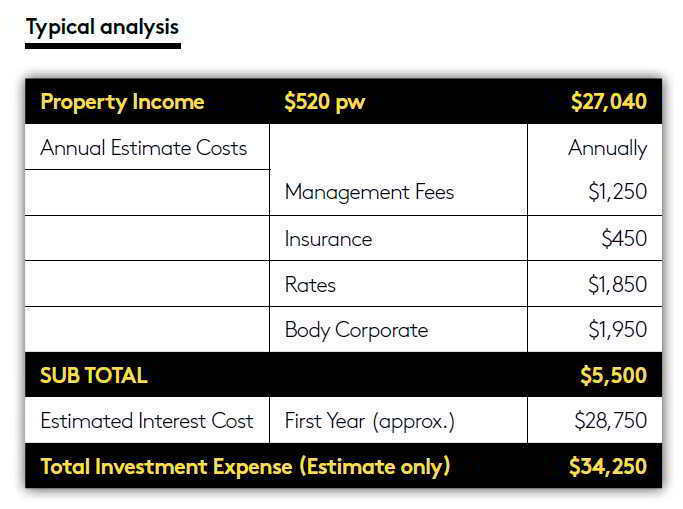 A property tax depreciation schedule can be extremely valuable to any property investor. Of course that investor must have a taxable income, to offset the depreciation against. Generally a property tax depreciation schedule for your investment property will help you pay less tax. The amount the property tax depreciation schedule says you can claim each year effectively reduces your taxable income for that year by the figure shown. Depreciation is known as a ‘non-cash deduction’ because it’s pretty much the only deduction that you don’t have to pay for on an ongoing basis. All other deductions, such as interest rates, property expenses etc. will hurt your hip pocket on an ongoing basis. NBtax’s aim is to enable you to put more cash back in your pocket by maximising deductions and whilst remaining compliant to Australian Tax Office requirements. NBtax was founded by Napier & Blakeley which was the first company in Australia to specialise in property tax depreciation, and we’re still the market leaders and have been for 30 years. There’s a way to unlock cash and grow your property portfolio faster. It’s called Property Tax Depreciation and with interest rates so low, it’s perhaps a property investor’s greatest tool to reducing your taxable income and increasing your tax return giving you more cash in your pocket! Every year, many Australian property investors fail to maximise their property tax depreciation claims. Collectively property investors in Australia are missing out on millions of dollars of unclaimed depreciation. If you have an investment property that generates an income, chances are you are eligible to claim property depreciation as a tax deduction. Most investment properties are eligible for tax deductions whether they be residential, commercial or industrial, no matter how small or old they are. It is a fact that most property investors are not aware that these deductions exist. 1. Depreciating assets which are plant and equipment – items within the building like carpets, lifts, appliances and white goods. 2. Building Allowances are primarily based on the structure of your asset. Claims for these are dependent on the original construction costs and when the building was built. As a rough guide, commercial properties built after July 1982 and residential properties built after July 1985 are eligible for deductions. The Australian Tax Office (ATO) has specified that Quantity Surveyors are the professionals suitably qualified to estimate deductions, and they must also be registered tax agents. NBtax has the most experienced tax Quantity Surveyors in the country, ensuring we provide not only maximised results but also a compliant assessment. If you’d like to earn more cash from your property investments and you’ve yet to start benefitting from property tax depreciation, then now is the time to get your property tax depreciation schedule.